Animal Friends, the member organization of The European Coalition to End Animal Experiments (ECEAE), calls upon people all over Croatia to answer a questionnaire by the European Commission on protection for laboratory animals and voice their concerns on animal testing. The Commission is in the process of drafting a revision of their 1986 Directive on The Protection of Animals used for Experimental and other Scientific Purposes (Directive 86/609/EEC) which should be finished by the beginning of next year. Part of the preparation for this is a public consultation to see where public opinion on this issue lies. The questionnaire is open until August 18 and the Animal Friends is encouraging as many people to log on to the Commission website as possible and complete it. The Commission recognises that the Directive needs to be revised to incorporate scientific developments in animal welfare, to question the use of primates and of genetically modified animals, and to take into account significant public concern about animal testing. - the killing of animals in dissection. Sandra Hannen, European Policy Director at the ECEAE stated, "This is a great opportunity for all who care about animal welfare to tell the Commission that they want the maximum protection for laboratory animals. The revision of this Laboratory Animal Welfare Directive presents a once-in-a-generation opportunity to make a significant difference for animals in laboratories and put an end to the suffering and pain caused by over 10 million experiments that take place across the EU each year." She added, "However, it's not about improving the lives of animals stuck in cages, it's about emptying the cages. 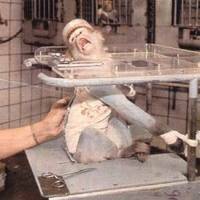 Animal testing is unreliable, unethical and bad science. If the European Union is really committed to minimising animal experimentation then setting clear targets to reduce the unacceptably high numbers currently used and replace animals in testing must be a priority." Animal Friends proposed to the Ministry of Agriculture, Forestry and Water Management to implement the ban on the use of primates for animal experimentation into the new Animal Protection Act of Croatia, but the Ministry rejected that proposal.